TAIYUAN, June 24 (Xinhua) -- While China has seen 55.64 million rural people lifted out of poverty in more than four years, "abject poverty" remains, and so President Xi Jinping has put himself on the frontline. Abject poverty persists in areas around old revolutionary bases, ethnic minority regions, border areas, and places with poor infrastructure, delicate environmental conditions and frequent natural disasters. The Lyuliang mountain region in north China's Shanxi Province is just such an area. It was an important staging-post on Xi's visit to Shanxi from Wednesday to Friday. In Zhaojiawa, a hillside village of mud huts, on Wednesday morning, Xi went into a hut and took a seat on the kang, a brick bed heated by fire, once widely used in the countryside but rarely seen nowadays. "Let's chat," Xi said to Liu Fuyou and his wife, both over 70 years old, inviting them to sit beside him on the kang. "Are you still able to do farm work? Is the drought serious this year? Your children work away from the village. Do they help you out?" the President asked. "Our family made less than 7,000 yuan (1,024 U.S. dollars) last year. We earned about 500 yuan by growing grain. The rest came from the government," said Liu, who lives with his 92-year-old mother. His five children left the village when they married. Xi turned to local officials: "What are you doing for this family? How many such cases are there in this county?" "We are ready to resettle them in a better area. There are 3,537 people in 115 villages in similar situations," answered Wang Zhidong, Party chief of Kelan County which administers Zhaojiawa. "How much will be spent on the resettlement? What are the new houses like? What will the villagers do after relocation?" Xi continued. His questions were every bit as detailed in another two households. Precision is a key word in Xi's war on poverty, taking the right measures, at the right time, in the right way, according to the situation . China has set 2020 as the target year to finish building a moderately prosperous society, which means complete eradication of poverty. The task becomes more difficult and costly as the process nears its end. There must be better support and more effective measures, Xi told a symposium in Taiyuan, Shanxi's capital on Friday. The central authorities coordinate the entire program, provinces take responsibility, while cities and counties ensure implementation of policies. Party and government chiefs hold the responsibility for all the work. People stricken by extreme poverty must join the "moderately prosperous society" along with the rest of the nation, Xi said. Lyuliang was just the latest stop on Xi's tour of the most needy regions since becoming general secretary of the Communist Party of China (CPC) Central Committee in 2012. In Xi's mind, if rural China, particularly those impoverished areas, is left behind, there will be no "moderately prosperous society." The CPC must put people first and use socialism to concentrate resources and accomplish big things, Xi said during the tour. "The Party and government serve the people. It is our duty to give people better lives," he said. At Zhaojiawa, Xi visited the office of the poverty-alleviation team. The office is in an abandoned mud shack, once occupied by villagers who had left the village. On the wall were charts and analyses. "The team work and live here. We will not leave until the village is free of poverty," said Jia Yuchun, the county official in charge of the work. Like Jia, more than 770,000 officials from government, universities, state-owned enterprises and civil associations work hard in the countryside across the nation. "The policies of the CPC Central Committee are in line with the situation. As long as we implement the policies, progress can be made," Jia said when responding to Xi's questions on the difficulties of the job. At Songjiagou New Village in Kelan County, Xi trudged through the rain to see the new houses for those to be relocated. Roads, water, broadband and cable televisions are in place. Schools, clinics, public squares and libraries have been built. "I lived in the shack with no water. Now I live in a new house without having spent any money," said villager Zhang Guiming. "The CPC cares for me. I will always stand by the CPC." Xi said it was just the first step. People must really settle down and become comfortable after relocation. "The CPC Central Committee can lead the people to unite to shake off poverty and become comfortable," Xi told the villagers and called on them to, "roll up your sleeves and work harder, together with the CPC Central Committee." By 2020 people in rural areas should have no more worries about food and clothing, be guaranteed education, basic medical care and housing. Disposable income will increase faster than the national average. All the rural population will rise above the poverty line. The government should focus more on the poorest areas in terms of funds and programs. Public services, infrastructure and medical care must be guaranteed, Xi told the symposium attended by Party chiefs of Qinghai, Shanxi and Yunnan, as well as Tibet Autonomous Region and Xinjiang Uygur Autonomous Region. 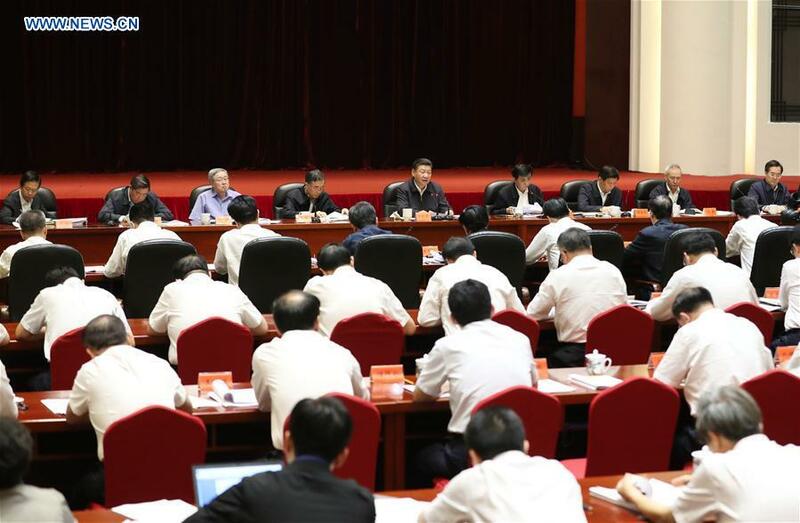 Party chiefs of some poverty-stricken prefectures, cities and counties also attended to report on their progress. Xi talked about developing industries that benefit people in the poorest areas. Transportation, water resources and ecological protection should engage as many poor people as possible. The rich east of the country and central government departments must do more, he said, adding that efforts should be made to prevent corruption and fraud. "As long as we pay great attention, think correctly, take effective measures and work in a down to earth way, abject poverty is absolutely conquerable," Xi said.